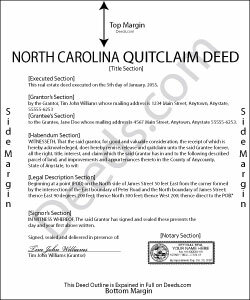 Both the grantor and grantee are required to sign a quitclaim deed executed in North Carolina. If there is more than one grantor or grantee, a signature from each is required. The grantor's signature must be acknowledged in accordance with the North Carolina notarial acts (47-38) Non-warranty deeds and quitclaim deeds do not need to show a source of title in order to record. Specific requirements must be met when registering a quitclaim deed. Quitclaim deeds are sometimes referred to as non-warranty deeds in this state. A quitclaim deed is not valid against lien creditors or purchasers for a valuable consideration until it is registered with the Register of Deeds in the appropriate county in North Carolina. The priority of recorded documents is based on the order of registration, unless it is stated otherwise on the registered quitclaim deed or on a separate registered instrument that is duly executed by the party whose priority interest is adversely affected. If instruments are registered simultaneously, the earliest document number or the sequential book and page number listed on the document will establish priority. (47-18). Glenella J. said: I wish you had the older deeds online to look at. Other than that, I was very satisfied with my experience.